Last week we asked you to submit your questions for U.K. Prime Minister, David Cameron, and you responded with 10,000 questions across topics like the violence in the Middle East, global arms trade, and tuition fees for U.K. students. You can also see how Cameron and a host of other leaders across various disciplines answered the same “Big Three” questions -- questions like “what is the biggest problem facing the next generation and what can we do to solve it?” and “if you could ask any other leader a questions, what would it be and who would you ask it to?” -- by going to www.youtube.com/worldview and clicking on the “Big Three Questions” tab. We’ll announce our next YouTube World View interview in the coming weeks, so check back here for more details soon. With many U.S. states facing budget crises, and the President’s recent budget proposal being met with skepticism by Republicans, the financial health of the U.S. is capturing interest around the world. As the budget debate heats up on Capitol Hill, we invite you to submit your questions for one of the most vocal opponents to President Obama’s proposed budget plan - Speaker of the House John Boehner (R-OH). Speaker Boehner will sit down for a special YouTube interview next week, in which he’ll answer your top-voted text and video questions about the budget and spending, as well as other hot topics like the economy, jobs, health care and foreign policy. Visit www.youtube.com/speakerboehner and use the Google Moderator gadget to submit your question and vote on others. Or you can tweet in your question using the hashtag #askthespeaker and it will automatically be eligible for voting in the queue. Video questions are highly preferred (though we also accept text). Videos should be about 20 seconds long and be sure to ask the question directly. Speak clearly and try to film in a place with minimal background noise. Keep the camera as still as possible. Feel free to be creative (use props, charts, etc.) to help your question stand out. If you have time, find an interesting backdrop that may help reinforce your message. Submit your question early. The final deadline to submit is Sunday, February 27 at midnight ET. We’ll post the final interview next Friday so stay tuned to see if the Speaker answers your question. won this month’s “On The Rise” contest, the program that lets you decide which up-and-coming YouTube user gets a spot on the homepage. Thanks to your support (and votes! ), D-trix is featured today. D-trix is a talented dancer with a big love for comedy. When he’s not spoofing Justin Bieber or teaching us how to rap, he’s dancing out a surprisingly romantic Valentine’s message. If you want to learn more about this program, head over to our “On The Rise” channel, where you can watch trending partners as well as “On The Rise” winners and nominees. And be sure to check out our browse page to see other budding YouTube stars. The people have spoken, and the people love Dominic! That’s right, D-trix from theDOMINICshow won this month’s “On The Rise” contest, the program that lets you decide which up-and-coming YouTube user gets a spot on the homepage. Thanks to your support (and votes! ), D-trix is featured today. It's been about two weeks since the Super Bowl aired, but our ears are still ringing from the noise of advertisers jockeying for position in Ad Blitz, YouTube’s contest to find the best Super Bowl ad. Last Sunday, we added Super Bowl spots to the Ad Blitz gallery as they aired on gameday, and people could come to the channel (or even hop on their mobile devices) to vote for their favorites. It was a great Super Bowl for mobile this year, with over 3.5 million views of the Ad Blitz channel happening on mobile devices. We received over 2.7 million votes, and in the first 30 hours after the game aired, commercials were viewed 47 million times. As the winner of Ad Blitz, Chrysler will be featured in the YouTube masthead all day today. Hats off to them for being voted the top spot by the YouTube community. We studied how Britney Spears built up anticipation for her latest music video. We analyzed thousands of keywords from videos tagged "revolution" in Arabic to see which words were most commonly used and presented them in a word cloud. We followed how a surprising and funny moment from "Family Feud" got heavily "passed around." We curated dramatic footage from the protests in Bahrain as well as those in Libya, Iran, Algeria, and Yemen. We learned that "trick shot" sports videos might be at an all-time high in popularity. Kevin Allocca, YouTube Trends Manager, recently watched "Angela Winbush - It's The Real Thing." The second technique, which we’ve internally codenamed Hydra (after Greek mythology’s nine-headed monster) tackles this problem by leveraging Google’s massive cloud computing capabilities. We split a single video into small chunks and process each chunk simultaneously on different machines. Hydra then reassembles all the processed chunks so that you see a seamless video, processed and published in a fraction of the time it would have taken to do it previously. 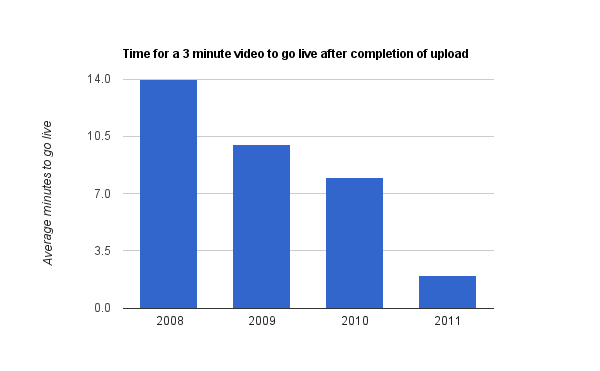 We now process videos seven times faster than we did in 2008. 60% of all YouTube videos go live in under a minute as compared to none last year. We know that there remains a lot for us to do when it comes to improving processing time and reliability and we certainly don’t think we have come close to solving the problem entirely. We have made big strides over the years and our speed is accelerating. When we make another big leap, we’ll post another blog to let you know. Until then, keep uploading! Few things can be more frustrating than waiting for what feels like years for that amazing video you just shot to finish uploading to the site so you can publish it and share it with your friends. Whether it’s the speed a video plays back, or the speed a video uploads, at YouTube speed matters. Why do we care so much about speed? Because we know that speed can mean the difference between you having a good experience, or you leaving YouTube in search of a better, faster one. Today, as we look at 2011, we’d like to review our progress in improving the processing and publishing speed for videos. By processing and publishing, we mean what happens behind the scenes between the moment you press the YouTube upload button to the moment that video appears on the site for your friends to see. Here is the challenge: 35 hours of video are uploaded to YouTube every minute. Over time, the average file size is going up, the average resolution is going up, as people switch to HD cameras and the average duration of the videos is going up. Moreover, an increase in resolution results in a quadratic increase in the number of pixels to be processed - a 1080p HD video has 2M pixels compared to 300k pixels in a 480p (DVD quality) video. The first is to overlap uploads and video processing without waiting for the upload to finish. This results in a base quality version of your video going live very quickly after the upload completes, making the link to your video active and shareable. , you can send a message to your sweetheart without anyone else knowing you’re sometimes referred to as “Honeybear”. When you upload your video, mark it as “Unlisted”. Then you can share it with only those people who have the URL. There are also a number of free web applications that can help you create original personal videos from text and images and easily upload them to YouTube, like Xtranormal, Stupeflix, Animoto, and One True Media. Cool video Valentine got them to agree to an actual date? Whether you’re a regular Casanova hoping to keep things exciting this year or an awkward first-timer trying to make a good impression, a search for ‘Valentine’s Day’ on YouTube returns over 250,000 videos dedicated to making every aspect of this day perfect for you and your significant other. The YouTube community provides a wealth of videos that you can access to help you make the date a success. Learn how to set the right mood with tips on creating your own floral arrangements, candle centerpieces, romantic dinners and Valentine's day chocolate mousse. They can also help you look your best with make-up and wardrobe tips. We all know that there’s more to a great date than ambiance and food, so the most novice dater can spice things things up with tips on dancing, flirting and even kissing. Searches on YouTube for ‘how to kiss’ are up 61% since 2008. If things don’t go so well, you can also look for ways to make breaking it off slightly less painful. And if you’re like millions out there spending Valentine’s Day alone, this video will help you make sure the best date you have is then one with yourself. Scrambling to make last-minute dinner reservations and to order a bouquet of long-stemmed red roses before your local florist is left with only withered strands of baby’s breath? You don’t even need to leave your computer to send your own personalized message of love this Valentine’s Day. With Unlisted videos, you can send a message to your sweetheart without anyone else knowing you’re sometimes referred to as “Honeybear”. When you upload your video, mark it as “Unlisted”. Then you can share it with only those people who have the URL. , a celebration of the best non-profit video on the site. Whether you created a high-definition documentary about street slums in India or shot a quirky cellphone video of rescue dogs at your animal shelter, we encourage you to submit your video at www.youtube.com/nonprofitvideoawards. Ramya Raghavan, News and Politics Manager, recently watched "Tahrir Square." If you’re a non-profit organization who has created one or more amazing videos in the past year, we have good news for you. For the second year in a row, YouTube is teaming up with See3 Communications to present the DoGooder Nonprofit Video Awards, a celebration of the best non-profit video on the site. Whether you created a high-definition documentary about street slums in India or shot a quirky cellphone video of rescue dogs at your animal shelter, we encourage you to submit your video at www.youtube.com/nonprofitvideoawards. On the Rise: We need your votes! and the videos page, Facebook and Twitter. Past winners like emilynoel83, justjesse197 and joshsundquist have seen their subscriber numbers jump, thanks to your support. This month we’re featuring four channels that have been moving from a simmer to a boil -- and for good reason! Check them out, and don’t forget to cast your vote by February 16, 2011, so we can feature the winner on the homepage on February 23. Pop music (and good-looking guys) need no translation. These two Moroccan-Dutch brothers formed the hip-hop group Fouradi back in 2009, and in 2010 their single “1 Ding” scaled the Dutch charts. Their YouTube channel has also garnered mad love. Graphic designer and heavy metal DJ Rick Gurnsey is the mastermind behind this genuinely comic, self-described “creepy” animated series. Once you start watching, it’s very hard to stop; imagine a Simpsons in which every character is Mr. Burns, and you’re partway there. Dominic “d-trix” Sandoval has turned his life into a one-man show. He’ll teach you to rap, he’ll spoof the Bieber phenomenon, he’ll sing (sardonically) the praises of mother’s milk. On theDOMINICshow, nothing is sacred, but just about everything is funny. Reed Timmer has made a living chasing and filming tornadoes, and we’re willing passengers on his wild ride. When he’s not running away from an oncoming twister, he’s filming the gorgeous weather that’s about to produce one. Warning: not for the adrenaline-phobic. If you’re inspired by what you see here, check out other awesome, up-and-coming channels. Visit our channel of On the Rise nominees, trending partners and winners, and look for more featured rising partners on the browse page. Sarah Bardeen, Music Community Manager, recently watched "The Sway Machinery - Gawad Teriamou featuring Khaira Arby." Another month, another crop of talented video-makers! February’s On the Rise nominees are in, and we need you to check out the four nominees below and choose your favorite. Cast your vote in the top right-hand corner of this blog. Here’s how On the Rise works. We identify channels who’ve gained a lot of subscribers in the past 30 days but haven’t yet reached the 100,000 mark. You vote on your favorite, and we feature the winner on the YouTube homepage and the videos page, Facebook and Twitter. Past winners like emilynoel83, justjesse197 and joshsundquist have seen their subscriber numbers jump, thanks to your support. to watch live coverage of events leading up to the big night. The live stream starts Friday night and continues all weekend, including some never-before-seen footage of Grammy moments. You can also be a fly on the wall at the storied, celebrity-studded Clive Davis party and check out the usually un-broadcasted Pre-Telecast, where The Recording Academy actually gives out most of its awards. (Fact: Taylor Swift won her first Grammy at a Pre-Telecast.) If that’s not enough, be sure to stick around for the after-party as well. To sweeten the deal, we’ve made a few video playlists featuring the year’s nominees as well as our favorite Grammy moments past. So if Sunday’s three-hour event feels too short, get your Grammy on early with the YouTube webcast, in partnership with The Recording Academy and TurboTax. The Grammys air Sunday, February 13, 2011 at 8 p.m. ET/5 p.m. PT on CBS. Music’s biggest night is almost upon us, and this year YouTube has your ticket to the pre-show and the parties! Starting today at 5 p.m. ET/2 p.m. PT, tune into youtube.com/thegrammys to watch live coverage of events leading up to the big night. The live stream starts Friday night and continues all weekend, including some never-before-seen footage of Grammy moments. We’re pretty sure there's a lot more to life than being really, really, ridiculously good looking. But in the meantime it’s Mercedes-Benz Fashion Week, and we’ll be bringing you the hottest shows from New York, streamed live from Lincoln Center on YouTube. Maybelline and YouTube will be bringing you both Fall Fashion Week and Spring Fashion Week coming in September 2011. YouTube will live stream 3-4 shows per day for each day of New York Fashion Week (February 10-17, 2011). From Carolina Herrera to Herve Leger to Narciso Rodriguez, all the hottest designers' shows can be watched live, starting tomorrow. Supplementing the live stream will be a content gallery featuring the hottest moments and highlights from this year's Fashion Week events: runways, designer interviews, and parties. The content featured will come from a select number of top premium fashion partners and will be representative of the diverse range of content and partners we have on the site. We will feature "best of" clips from established editorial voices in the fashion world like Fashion TV (FTV.com), Vogue (Style.com) and Nylon Magazine (Nylon TV), as well as homegrown YouTube gurus like our "Haul Girls" (JuicyStar07, AllthatGlitters21). Visit www.youtube.com/liverunway and experience Fashion Week like never before. Tune in tomorrow, February 10 for our first live stream. Will Houghteling, YouTube News and Politics team, recently watched "View of Tahrir Square." We used the questions you asked of the President of the United States to create some unique word art. We tracked the biggest trends the week before the big game . We curated powerful footage from the protests in Egypt. We saw how a music video from 1995 still sees a bump in views every single month. We looked at on-the-scene weather footage from a snowstorm across the United States and a category 5 cyclone on the coast of Australia. We tried to figure out how a group of young dance students near Portland got popular all the way in South Korea. Kevin Allocca, YouTube Trends Manager, recently watched "Taxista canta igual que Michael Jackson"
,” Showtime contacted cutting-edge creators from across the Web and asked them to tell a tale in an innovative way. The series sports the work of some of YouTube’s top creators, so naturally we’re interested in learning a whole lot more about how “SHORT stories” came to be. Showtime's Trevor Noren tells us more. 1) What gave you the idea to use YouTube stars in this way? YouTube has become a venue for animators and filmmakers to explore new ways to communicate a narrative. Whether it’s an established artist like Don Hertzfeldt or a talent the community has discovered, like Cyriak or Levni Yilmaz, YouTube has offered an opportunity for artists to experiment and find out what people respond to. That spirit of innovation seemed like a natural fit for our brand. Unique storytelling is the hallmark of what we do as a network: our shows challenge viewers with characters they haven’t seen before. “SHORT stories” is a way for us to bring our brand to a new audience while at the same time showing the work of these amazing artists to our subscribers. 2) What was the process of working with them? Our mission statement to the artists was pretty simple: “Tell a story in a way people haven’t seen before.” We figured a directive that open-ended would create a huge range of results. They didn’t disappoint. Don Hertzfeldt made up a language. Michael Langan employed thousands of still images to show a run around his block. Cyriak used his hands to tell the story of evolution. Whether acquiring a film already in the works or commissioning something entirely new, we did not interfere with the artists’ creative process. The filmmaker explained what they planned to do and we let them run with it. As a result, we ended up with an incredibly diverse collection of films. 3) What have you learned about the YouTube community over the course of this project? How much they embrace the bizarre. It doesn’t matter if they know exactly what the filmmaker is trying to say with their video. They recognize the dedication that goes into creating the piece and they recognize the personality and vision behind it. It’s really amazing and inspiring how open-minded the community is to new ideas. 4) Will you pursue more of these and if so, how are you finding the filmmakers? “SHORT stories” will be ongoing. We’ve identified a few potential candidates. We’d like to keep who they are a surprise. That said, the YouTube community is already helping us identify potential filmmakers. Names pop up all the time in comments on the videos. Everyone from Czech great Jan Svankmajer to Mystery Guitar Man. The best way for us to find new talent is to watch and listen to the YouTube community. 5) What’s something no one would know about these videos by looking at them? The sheer amount of time that went into the creation of some of the films. Inspired by a vintage nutcracker that looked like a fish, it took PES five years to find all of the objects that went into “The Deep.” For Michael Langan, stitching together all of the still images for “Dahlia” took one month for every minute of the film. “Pretty, Dead” by Jeff Scher consists of more than 3,000 individual drawings. The final products themselves are incredible, but when you really start to understand what went into creating them, it’s remarkable. For “SHORT stories,” Showtime contacted cutting-edge creators from across the Web and asked them to tell a tale in an innovative way. The series sports the work of some of YouTube’s top creators, so naturally we’re interested in learning a whole lot more about how “SHORT stories” came to be. Showtime's Trevor Noren tells us more. You can also access the channel and commercials from your web-enabled mobile device: go to m.youtube.com/adblitz from your mobile browser (or enter "youtube.com/adblitz" and you should be redirected). You may notice the streets will be exceptionally quiet this superb 'ol Sunday afternoon, with perhaps only a few pizza delivery vehicles passing by, as Americans gather en masse around the big screen to watch our annual football, food and advertising spectacular: Super Bowl XLV. Two storied teams from the heartland - the Pittsburgh Steelers and Green Bay Packers - will take the field to conclude an exciting and, at times, controversial NFL season. We can only hope the quality of the game will live up to the stage and hype. Sunday will be among the top five pizza-ordering days of the year, with some chains accepting pre-orders for pies. Papa John's is estimating they'll travel 300,000 miles in total for deliveries. And of course, the Super Bowl is an advertising bonanza, with many people tuning in to see the celebrity-laden ads with absurdly high production values as much as to see the game. Besides paying to produce the ads themselves, advertisers are buying airtime from FOX at a rate of around a whopping $3 million for every 30 seconds, according to MSNBC. Is it worth it? This is a question that you can help settle, by going to our Ad Blitz channel on Super Bowl Sunday to watch and vote on Super Bowl commercials. We'll be adding commercials from participating in-game advertisers to the channel as-close-as-possible after they air, so you can watch, compare, and vote on ads to your heart's content. Your voting will help determine the champion ad, which will be rewarded with a placement in our homepage masthead ad unit, along with the four runners-up, on February 19.
the Google Art Project—a new site that lets you explore hundreds of artworks from 17 of the world’s most acclaimed art museums in extraordinary levels of detail, as well as take 360 degree tours of the museums using Street View technology. With this project comes the launch of many of the museums’ very own YouTube channels -- along with an array of new videos about the artworks featured in the project. On the Google Art Project site you can explore 1000+ pieces of artwork at an amazingly high resolution levels. While zooming into a work of art you can also watch YouTube videos about it, as well as reading more about a particular artwork and its artist. More than 170 works of art in the project have accompanying videos; learn about a professional snowboarder’s perspective on an alpine landscape, the 20+ locations of Rembrandt’s ‘Night Watch’ , the preservation process for Van Gogh’s ‘The Bedroom’ or even the live reaction of a pair of identical twins to a 17th century painting of twins. You can browse a selection of the featured artwork videos on the Art Project’s YouTube channel, where you can also see behind the scenes footage of the project. This project began as a 20% project for a group of Googlers who are passionate about making art more accessible online. We hope you enjoy these videos and maybe deepen your understanding of some of the world’s most famous works of art. Earlier this week, Google unveiled the Google Art Project—a new site that lets you explore hundreds of artworks from 17 of the world’s most acclaimed art museums in extraordinary levels of detail, as well as take 360 degree tours of the museums using Street View technology.